NOTE: This bike has been stolen! Sometime between 5:00pm on Tuesday, November 22, 2005 and 7:25am on Monday, November 28, 2005 this bike, and my Trek 820 were stolen from my garage in Barrie Ontario. If you see either bike, please contact me and/or the police as soon as possible. As it is a rather unique bike, I hope someone spots it! 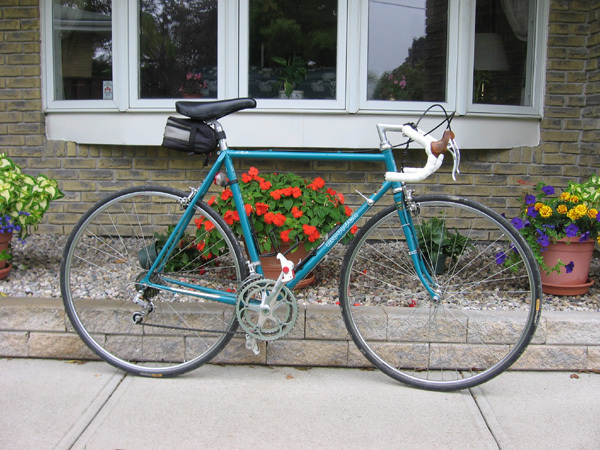 This page discusses a vintage Jim Moulden road bike that I purchased in August of 2003. It is from approximately 1986 (as far as I know at this point), and is my everyday riding bike. Below I will describe the components in some detail. It is my hope that this page will be both interesting and helpful for others who are researching vintage bikes. If you happen to know more about any of these components, or have some information that you feel I would be interested in, please do not hesitate to email me. Also, if you would like to correct anything that you see here, please do -- I cannot claim to know much about these things... Thanks to those who have emailed me comments to date! Overall, this bike is not a "period correct" or perfectly matched piece of machinery. To use the terms of one of my readers, it's an "eclectic" mix of parts, likely obtained from various sources. My feeling is that Moulden sold the frame and fork only, and the original purchaser built up the bike with a mix of parts from several different bikes, likely of slightly different vintages. For example, the pantographed Guerciotti parts were almost certainly from a Guerciotti bike at one point, and transferred to this frame afterwards. Both rims are Araya 700C rims from Japan. The front quick-release mechanism is marked "Sunshine" on the handle. The rear, however, is marked "Suntour Japan." My guess is that one has been replaced, although they both appear to be of the same approx. vintage. The saddle is an Avocet Racing II. According to First Flight Bicycles, this model of seat first appeared in either 1980, or 1986. Based on the rest of the components on the bike, I'm guessing 1986 is correct. The single bolt seat post is marked "Campagnolo Brev. Inter." horizontally along the top. There is also a small "272" on the top rear of the post. 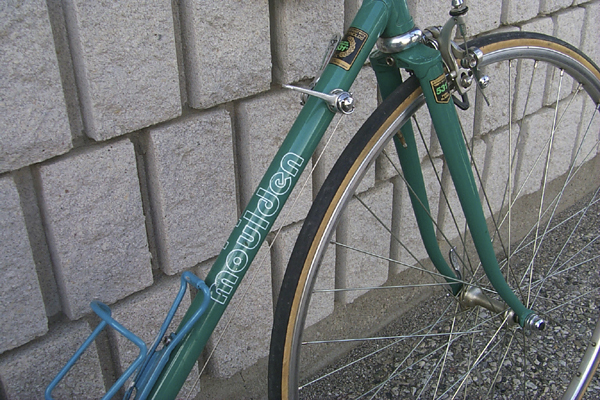 However, as well as the Campagnolo marks, the post is pantographed with the "Guerciotti" (pronounced "gwer-chee-OH-ty" according to Sheldon Brown) name running vertically, and 8 vertical lines (2 white on the front and 2 on the back, 2 red on the left side, and 2 green on the right side). Apparently the act of pantographing names onto Campy parts was quite common in the 70s and 80s, and was done in the factory by Campy. Colnago, DeRosa, Merckx, Ciocc Olmo, and Basso are some of the other brands that had similar work done. This seat post also appears to be rather short (again, most likely to save weight.) This seatpost is likely either Super Record or Victory. The brake levers are marked "Campagnolo," and are also pantographed with the Guerciotti "G in a Star" logo, and green/white/red diamonds below. Both the front and rear brakes are Campagnolo brakes, and also have the Guerciotti pantographing. 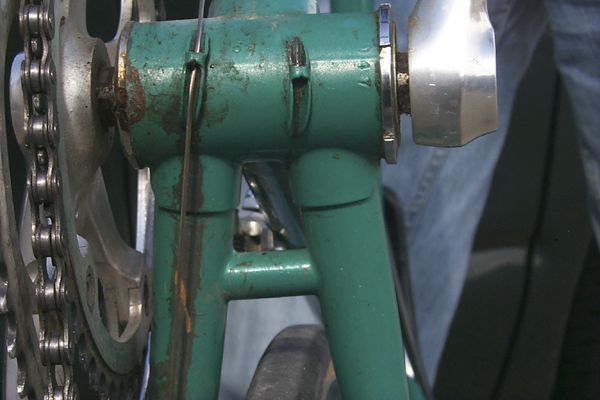 The shift levers are both marked "Patent Campagnolo" on one side, while the other side has the Guerciotti "G in a star" logo, and the green/white/red stripes pantographing again. The chainrings are Campagnolo, and are marked "Brev Campagnolo Made in Italy" The large 'ring is marked "-53-A5-" while the small is marked "-41-A5" The first number indicates the number of teeth, but I'm unsure about the meaning of the "A5" designation. Check out the picture below to get a look at the chainrings. 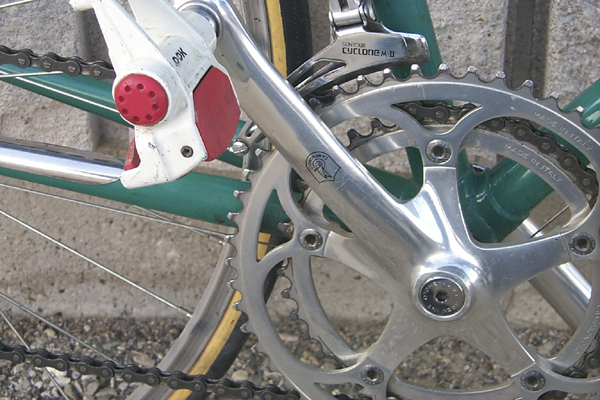 The front derailleur is a Suntour Cyclone M-II. It is marked "Maeda Ind. Ltd. Japan." It also has the code "ZK" marked on the back of the cage. According to www.vintage-trek.com this corresponds to a manufacture date of November 1983. 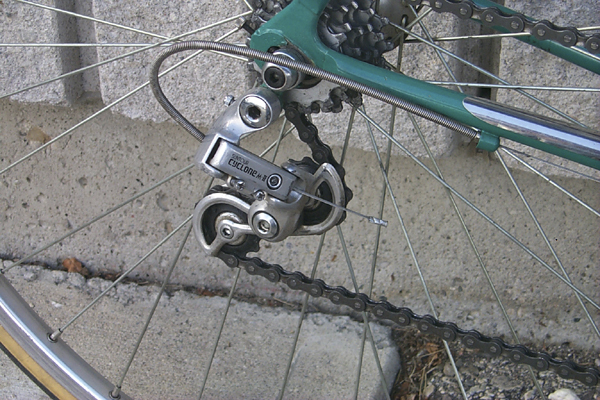 Check out the picture below to get a look at the front Derailleur. The original rear freewheel was marked, as best I can tell, "Made in Italy REGNA FX/CX-5" Some readers have mentioned (and I have since verified that they were correct) that it more likely read "Regina", and "CX/CX-S" The freewhell was thus made by Regina in Italy. The CX/CS-5 marking would imply that these cogs were made for the Regina Corsa and Extra Corsa six- and seven-speed freewheel bodies. The individual cogs are marked (large > small) 18A1/17A1/16B1/15A2/14D1/13C1. As of June 2005, I noticed that there was some side-to-side play in the freewheel, so when I was getting a spoke replaced I also got the freewhell replaced. I found that freewheels are difficult to obtain, and ended up with a Shimano CX 14-24. The lower gearing is much better for the riding I do, and is a lot more manageable on hills! However, I don't think the quality of the Shimano freewheel is as good as it could be, and it unfortunately doesn't fit the "vintage" feel of the rest of the bike. The handlebars are "Sakae Custom" "SR Road Champion" bars. According to a source that I've now misplaced, SR joined with SunTour in 1990 to form SR Suntour. The only marking on the stem is the word "Custom" printed horizontally across the front. "Custom" may also be a SR product. The chain has various markings on some of the links. Some are marked "FRANCE," some "I," some "Z," while some have the "SACHS" name inside a triangle logo, while others have the "SEDIS" name inside a triangle logo. It is my understanding that these two companies combined into one at some time, although it appears that for a while they used both names. The headset is a Specialized headset, with no visible markings other than the word "Specialized"
The gum-rubber hood covers are "Mandala" brand, and are marked with "Pat(ented)"
The pedals are Look clipless, which are newer than the rest of the bike. 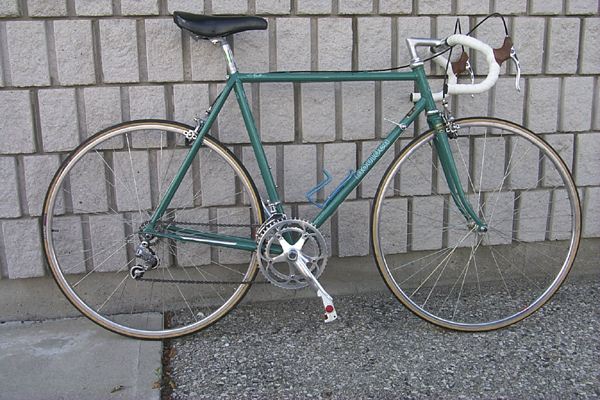 Originally, a bike like this would likely have had Campy or Gipiemme pedals with Christophe clips. Here's what the bike looks like as of October 2005. Since the last photos, it's got new tires, the new freewheel (not that you can really see that...), a wedge pack, and two new (matching) black bottle cages. A good looking bike, although I'm looking for input on the bar tape colour! As I said earlier, I welcome any and all comments on this bike (or any of the selected components). Please email me with anything you may have. I will try to post better pictures at some point, and will attempt to update this page as I learn more about the components. For those interested in vintage bikes and specifically Campagnolo, check out the book Campagnolo: 75 Years of Cycling Passion!